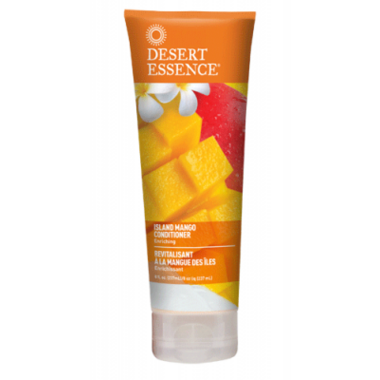 Desert Essence Island Mango Conditioner features nutrient-rich Mango Butter to deeply moisturizes hair with a burst of EFAs (essential fatty acids) that leave it feeling smooth and silky. Organic Shea Butter and Jojoba Oil help enhance the condition of hair. Natural, tropical mango aroma transports the senses for a luscious, nourishing experience. This Desert Essence Italian Lemon Conditioner has a matching shampoo. Try it out! Ugh. Okay, we love the desert essence conditioners. My son can't get enough of the coconut one. I adore the Italian lemon. But this one? As far as texture, and how it moisturizes and enriches, it's fantastic. But it should carry a huge warning label that not only does it not smell like mango at all, it has such a strong scent, the fragrance that is not mango at all lasts even after you've washed your hair twice and used another conditioner. Cloying. Powerful. Not mango. Not pleasant. There is nothing here to suggests we'd get a fragrance other than mango, so I feel like I've been duped, to be frank. BUYER BEWARE. Good conditioner that DOES NOT SMELL LIKE MANGOES AND WILL MAKE YOUR HAIR SMELL LIKE NOT MANGOES FOR A VERY VERY LONG TIME. Sad face. I like the ingredients and I quite like mango butter but I find the scent to be too strong. This conditioner, compared to others I have tried, didn't make my hair very soft and in fact my hair (which is fine and straight) ended up looking oily and it felt greasy. Perhaps butters are not the best idea for my hair. This conditioner is great! Doesn't leave a heavy coated feeling to your hair. Rinses well and leaves your hair soft. Perfect! My favorite conditionner it smells great and detangles my hair. My favourite conditioner! It detangles my messy, curly hair easily and leaves it so soft and smelling amazing.